Samantha here, and today I'm sharing a cool, winter friendship card! And I LOVE those little snowmen! Eeeeeek! Super adorable, right?! 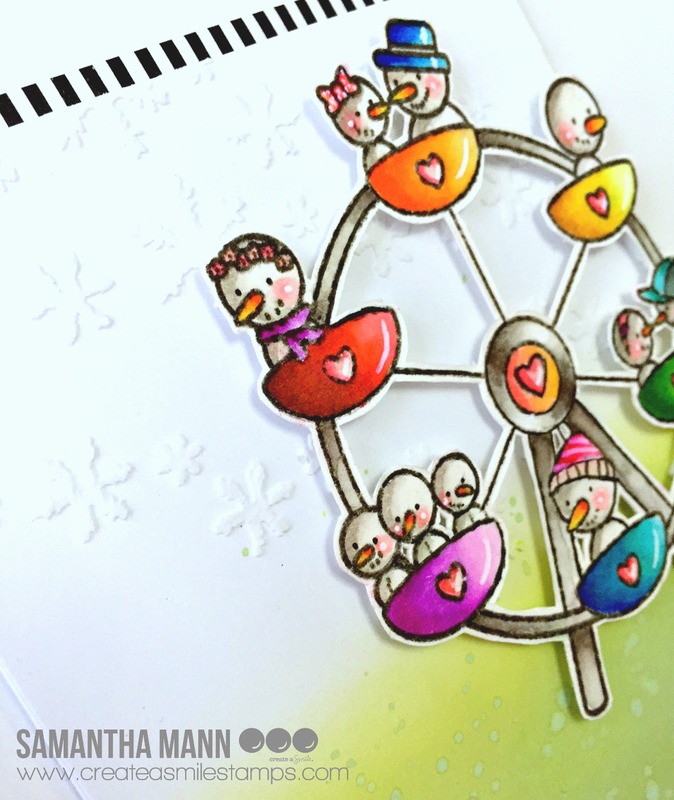 I was flipping through my stamps and BAM, I knew I had to make a rainbow merry go round! Alright, let's get down to it! - once dry, fussy cut out! If the merry go round seems too intimidating to fussy cut out (It's not that bad, promise - but a good exacto knife is your best friend here! Ha! ), you can stamp the image onto your card, then only cut out the snowmen and their carts! Easy fix! That ADORABLE merry go round image is sooooooo fun!! It's from the A Friendly Turn stamp set! 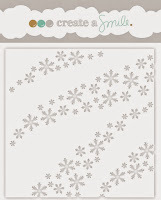 The awesome white embossing paste texture was used with the Waves of Snowflakes stencil. 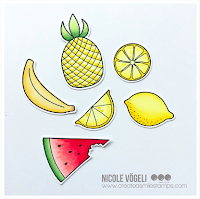 Have you been eyeing some of the stand alone dies that Create a Smile sells?! What are you waiting for? Go get your hands on them!! They were just all stocked back up a few weeks ago, and everything should be there for you! Hello crafty friends, Nicole here. I love to play with my Distress Onxide Inks and wanted to try the ink smooshing technique. Stamp the wreath and the sentiment on watercolor paper. I used black pigment ink and covered it with clear embossing powder. Stamp the flower on a piece of watercolor paper and cover it with clear embossing powder as well. Color the flower with a paint brush, let it dry and cut it out. die cut your panel and adhere it on your card base. add the flower with some foam tape. You do not need Distress Oxides for this technique. You can use your Distress Inks or regular Watercolors. Hi crafty friends and welcome back to our crafty space. Raluca here with a new card showcasing a few amazing products from Create a Smile Stamps. I don't know if you saw Francine's card from our Comeback Party, but I loved what she has done with the lantern, turning it into a Halloween lantern! First I prepared two white panels die cutting them using the largest stitched rectangle. On one of them I stamped in VersaMark the Skulls cling stamp and white embossed it and I added 3 Distress Inks using the emboss resist and ink blending techniques. Then I cut the inked panel smaller and adhered it on to the base panel. Next I stamped, colored and fussy cut the lanterns using orange and yellow colors. After I was done coloring, I added the googly eyes and draw on each a little nose and a smile. I mounted them on to the panel and stamped above them a string from the set. 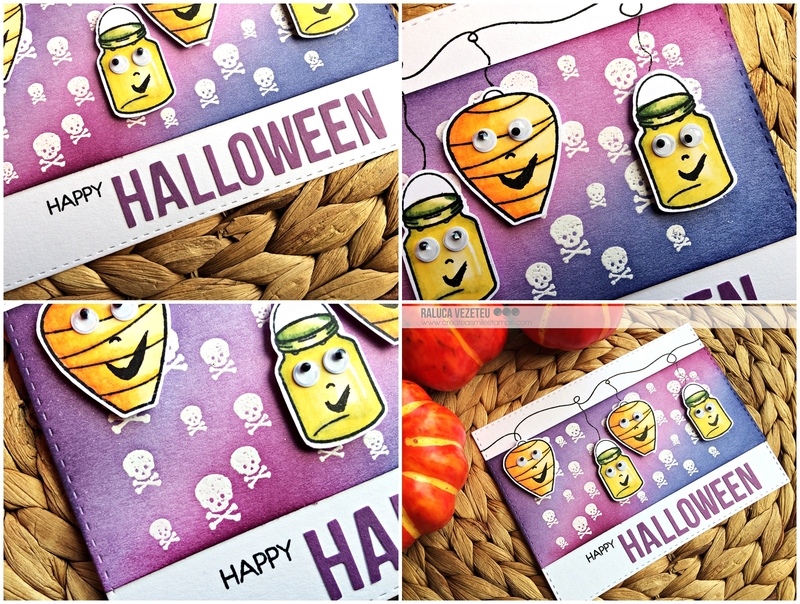 For the sentiment I stamped a happy from the "Just saying Hello" set and formed the "Halloween" word using purple alphabet stickers (have you seen the collection of alphabet stickers that Christine carries in the shop?). And my card was done. It was quite easy to make and I had a ton of fun creating these Halloween lanterns (thank you Francine for your clever idea!). Hi everyone! I thought I've used the new In Bloom stamp set quite well, until I realised that I've not touched the big flower. That was my inspiration for this card. I wanted to make a one-layer card but I had a piece of die-cut left from my last card and decided to make use of it. Super easy card and you can even do it with images of critters, coffee cups, trees, card, or even just simple shapes. A tip is to stamp down your biggest image first (in my card, the yellow flower). This way, you know that you'll definitely have enough space for the number of large images you want and fill in the space with any smaller images. 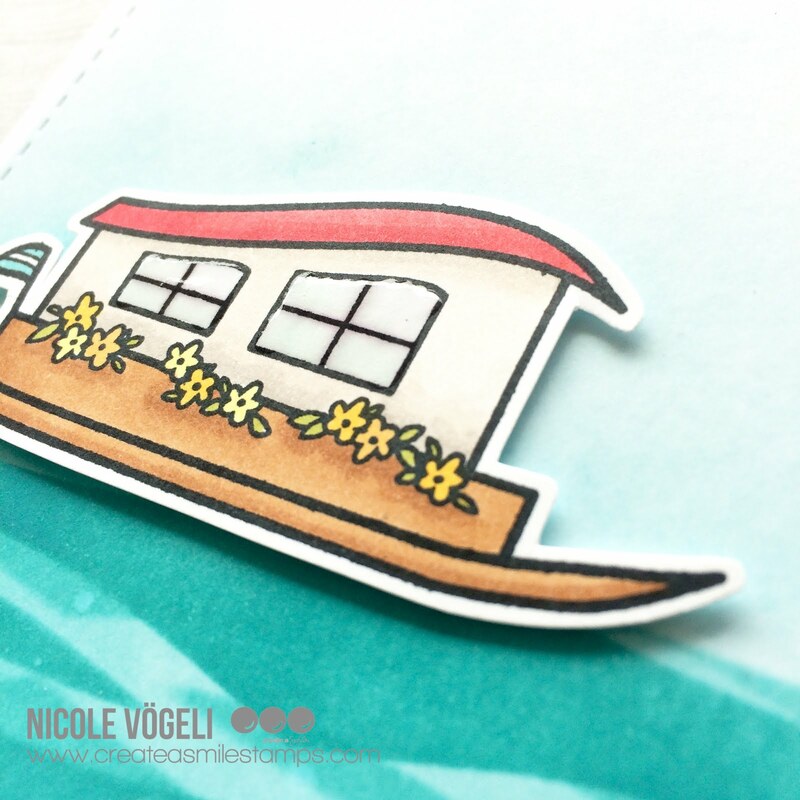 Samantha up on the blog today, and I'm sharing a cute little empathetic card...with a zombie pig! Ha! He he he he!! I love this creepy set, it's perfect for Halloween! But it can be used for much more, too!! See? This is the perfect card to send to someone going through a hard time, to let them know they're not alone! - for the 'ground' of the card, ink blend Vintage Photo and Fossilized Amber Distress Oxide Inks, then flick on some color for the 'dirt'. You could color this little guy in fully in green to be a 'real' zombie, or you can color him in all pink! I love how the green tinge makes him seem a little sick or stressed! Ha! 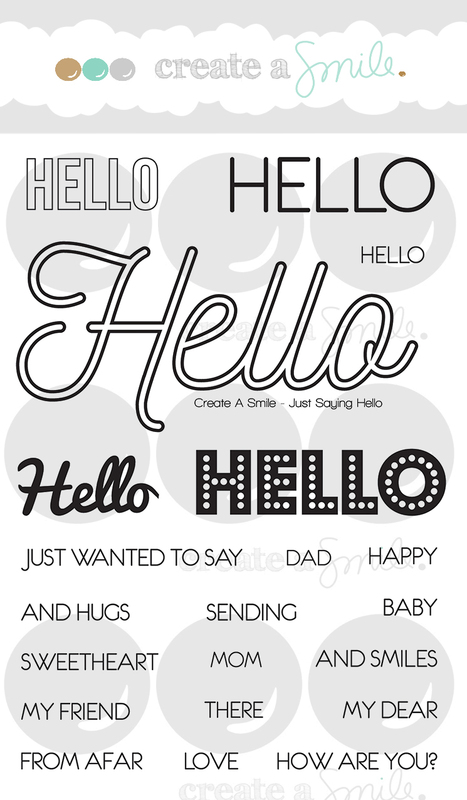 I love the stencils by Create A Smile and I wanted to use them more often. They are so versatile and fun to use. To Brighten Up Your Day! Welcome to Guest Designer Kerstin Franze!